ZoomIt ~ Annotation Screen Zoom Tool ! Make your technical presentation much more effective and impressive. 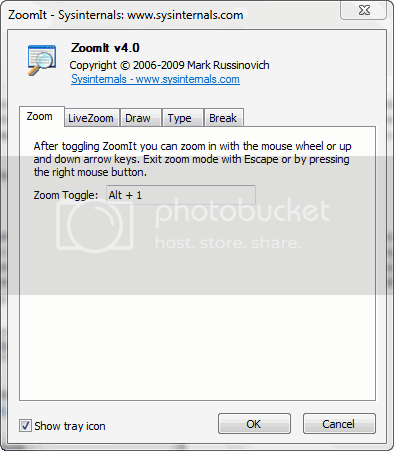 ZoomIt, available on Sysinternals from Microsoft developed by Mark Russinovich is a simple but useful screen zoom tool which let us enhance our technical presentation where we usually demonstrate any application. Its a direct run utility which runs unobtrusively in the system tray and get activated as we press particular assigned shortcut key. Using it we can easily zoom on a particular area of screen, move around while zoomed, can draw on that zoomed image and it works perfectly on any version of Windows. ZoomIt can be run directly without any need of installation and on its working window we can specify alternate hotkeys for zooming and for entering in drawing mode without zoom and its drawing pen color and size can be customized accordingly. By default it comes with already customized hotkeys as well as we can make it according to our requirement. In this tool we can use Zoom option which can be controlled by Mouse scroll, LiveZoom which is supported on Windows Vista and higher, drawing mode where we can draw, erase anything on screen, too we can write, draw different text and shapes respectively with red, green, blue and yellow color. And also we can enter in timer mode from its Break menu item. We can customize the behavior of ZoomIt from its UI which is merely 5 tab single Window, very compact and handy.